“The United States is in the midst of the ‘unconventional revolution in oil and gas’ that, it becomes increasingly apparent, goes beyond energy itself. But is this really a revolutionary transition from scarcity to abundance, was it a surprise, and should technology get all the credit? I don’t think so. 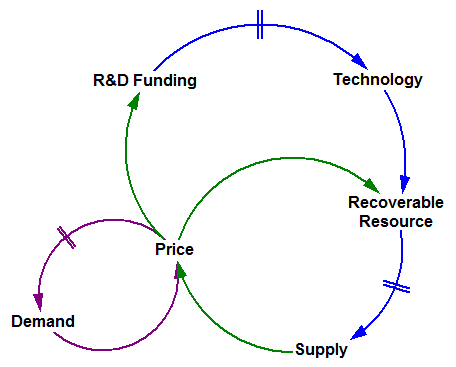 Resources, on an energy basis (EJ). Cumulative production from EIA; note that gas production data begins in 1980, so gas cumulative production is understated. In spite of increasing unconventional resources, there’s actually less oil than there was, mainly because a lot of the 1995 resource has since been produced. (Certainly there are also other differences, including method changes.) For gas, where one can make a stronger case for a miracle due to the large increase in unconventional resources, the top line is up a whopping 3%. Even if you go with EIA/INTEK‘s ~2x larger estimate for shale gas, resources are up only 35%. Call me conservative, but I think an abundance revolution that “disproves” scarcity would be a factor of 10 increase, not these piddly changes. You could argue that the USGS hasn’t gotten the memo, and therefore has failed to appreciate new, vast unconventional resources. But given that they have reams of papers assessing unconventional fields, I think it more likely that they’re properly accounting for low recoverability, and not being bamboozled by large resources in place. 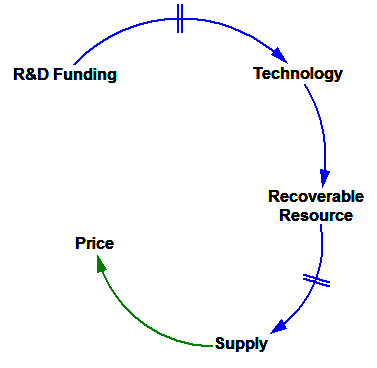 Reserves involve less guesswork, but more confounding dynamics. But reserves tell about the same story as resources. Oil reserves are more than 40% off their 1970 peak. Even gas reserves have only just regained the levels achieved 40 years ago. 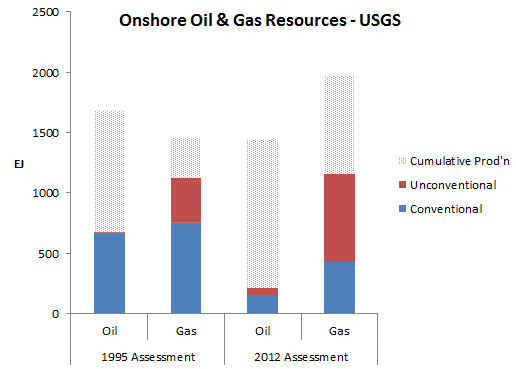 Unconventional natural gas resources are also becoming increasingly viable. Coalbed methane, which accounts for about 25 percent of potential natural gas resources in the U.S., will displace nearly a trillion cubic feet (TCF) of gas from conventional resources in the near term and perhaps several TCF by the turn of the century. Similarly, production of gas from low permeability resources may displace some production of conventional gas as increasingly smaller conventional accumulations are developed. Coalbed methane and tight gas, both abundant in the Rocky Mountain and Appalachian regions, will likely experience significant production increases. Optimistic scenarios suggest that tight gas and coalbed methane resources may provide more domestic natural gas production than conventional resources by the year 2010. Horizontal drilling technology will most likely unlock the large currently uneconomic gas resources in tight reservoirs. Technologies like this will most certainly change the status of what are presently considered unconventional resources. Should we be surprised to see supply increasing in the current price environment? Again, I’d say no. 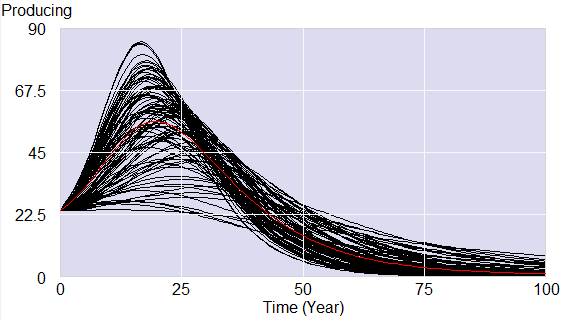 The idea that oil and gas have supply curves is certainly much older than its appearance in the 1995 USGS assessment. Perhaps the ongoing increase in shale gas development, when prices have collapsed, is a bit surprising. But then you have to consider that (a) drilling costs have tanked alongside the economy, (b) there are lags between price, perception, capital allocation, and production, and (c) it’s expectations of price, not current prices, that drive investment. Does tech get the credit? But there’s more than tech going on. And much of the tech evolution is surely a function of industry activity funded out of revenue or accumulated through production experience, rather than pure government R&D. If tech is the exclusive driver of increasing abundance, you’d expect costs and prices to be falling. Gas prices are indeed well off their recent peak, though one could wonder whether that’s a durable circumstance. 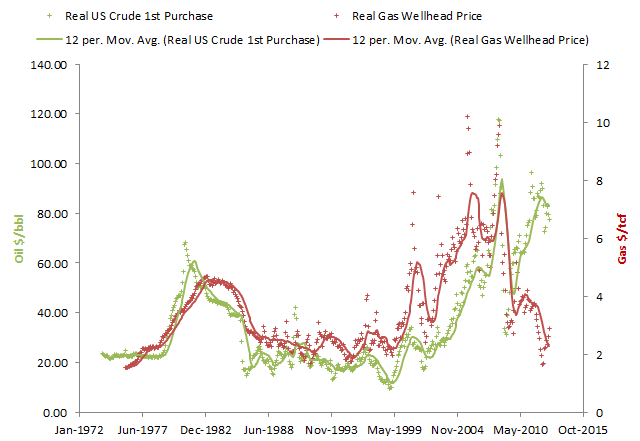 Even so, gas is no cheaper than it was in the 90s, and more costly than in the pre-OPEC era. Oil isn’t cheap at all – it’s close to its historic highs. So, if there’s anything here that one might call a tech fingerprint, it would have to be the decline in gas prices post-mid-2008. But that coincides better with the financial crisis than with the gas boom. 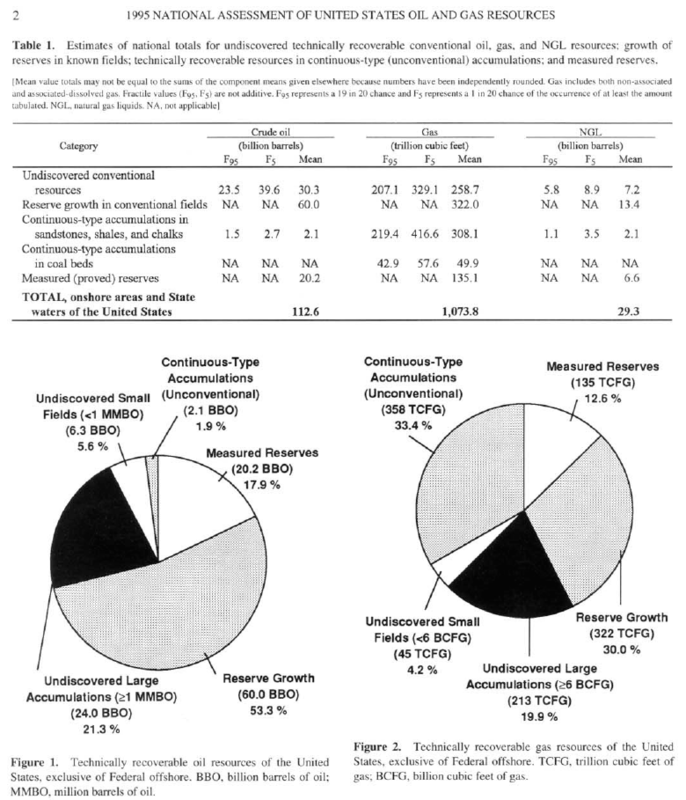 Cost data are less current, but if anything the cost picture is less sanguine. “Real gas equipment costs are 12 percent higher and operating costs are 37 percent higher than for the base year of 1976,” says EIA. First, let’s not kid ourselves. There’s less oil and gas under US soil than there has ever been. Technology has at best done a little more than keep the wolf from the door, by lowering the cost of exploration and development by enough to offset the increases that would result from increasing physical scarcity. It’s possible that the effects on shale and tight gas cost and availability have been dramatic, but there are plausible alternative hypotheses (financial crisis, moving up supply curves, and delays in production capital investment) for current prices. Personally, I doubt that technology can keep up with physical scarcity and demand growth forever, so I don’t expect that gas prices will continue walking back to 1970 or 1960 levels. The picture for oil is even worse. But I hope that at some point, we’ll come to our senses and tax CO2 at a level high enough to reverse consumption growth. If that happens abruptly enough, it could drive down wellhead prices. None of this sounds like the kind of tailfins and big-block V8 abundance that people seem to be hoping for. Author TomPosted on February 12, 2013 Categories energyTags gas, oil2 Comments on Energy rich or poor? Most climate skepticism I encounter these days has transparently crappy technical content, if it has any at all. It’s become boring to read. The problems in Greece are interdependent and all have their roots at the fact that the model of government that has been the status quo in Greece since WWII isn’t working and needs radical change, but the people who run the system know no other way, so the problems keep compounding with no solution in sight.There used to be two tiers of taxation for oil: one was for heating oil, which was relatively low, and the other was for oil used for all other purposes (e.g. for diesel cars etc) which was taxed at about 100% over the fuel cost. Because of the inability of the government institutions to enforce the laws in Greece (which on paper are tough but in practice are not enforced because the system is incompetent), there has been widespread abuse of this: from refineries to gas stations, many oil merchants have been branding diesel as heating oil to evade the tax, and then selling at as non-heating oil, doubling their profit and ripping off both the consumers and the government. So they finally decided to do away with the two separate tiers of taxation and tax all oil as non-heating oil. To make up for the huge rise in cost to the end consumer they established obscure and bureaucratic criteria for lower income families to submit applications to the government for partial reimbursement of the extra tax, the idea being that this would deprive the sellers from a means to cheat and would still enable end consumers in need to get reasonably priced heating oil after reimbursements. However this didn’t work and instead people just massively stopped using oil for heating, which is by far prevalent in Greece (another government failure, for a country with no oil resources and lots of sun and wind). There are entire older building blocs in cities that were built without fireplaces (which up until recently in modern city apartments were more of a symbol of affluence than of any practical use – people essentially never using them) that have just turned off heating altogether, and fights amongst tenants are commonplace for disagreements over whether to turn on heating or not (which in older buildings is collective so it’s heating for all or for none). Those who cannot afford it just don’t pay so sooner or later most buildings in working class neighborhoods are forced to abandon central heating and sustain the cold or improvise. Because the government again hadn’t foreseen any of this, and wood burning was never particularly widespread in Greece, there had not been standards for wood or pellet burning stoves. So the market is flooded with low quality wood-burning stoves which are totally inefficient and polluting. So suddenly from December the larger cities in Greece are filled with smog and particulates for the first time from inefficient wood-burning stoves, and from burning inappropriate wood (e.g. people burn disused lacquered furniture at their fireplaces, which is very polluting). Cases of asthma and respiratory illnesses in the larger cities since December have skyrocketed. In the meantime forests and even city parks are raided daily by desperate unemployed people who cannot afford heating (especially in northern Greece), who cut down any trees they can get their hands on. It’s hard to see that there can be any short term solution to this, in the middle of the worst economic crisis Greece has faced since WWII. A silly NYT headline claims that Rise in Oil Tax Forces Greeks to Face Cold as Ancients Did. The tax raised the cost of heating oil 46%, which hardly sends Greece back to the Bronze Age. Surely the runup in crude prices by a factor of 5 and a depression with 26% unemployment have a bit to do with the affordability of heat as well? And doesn’t the unavailability of capital now make it difficult for people to respond sensibly with conservation, whereas a proactive historic energy policy would have left them much less vulnerable? The kernel of wisdom here is that abrupt implementation of policies, or intrusion of realities, can be disruptive. The conclusion one ought to draw is that policies need to anticipate economic, thermodynamic, or environmental constraints that one must eventually face. But the headline instead plays into the hands of those who claim that energy taxes will doom the economy. In the long run, taxes are part of the solution, not the problem, and it’s the inability to organize ourselves to price externalities that will really hurt us.